Night blindness is the inability or reduced ability to see in dim light or darkness. It also refers to the condition in which the time it takes for the eyes to adapt to darkness is prolonged. 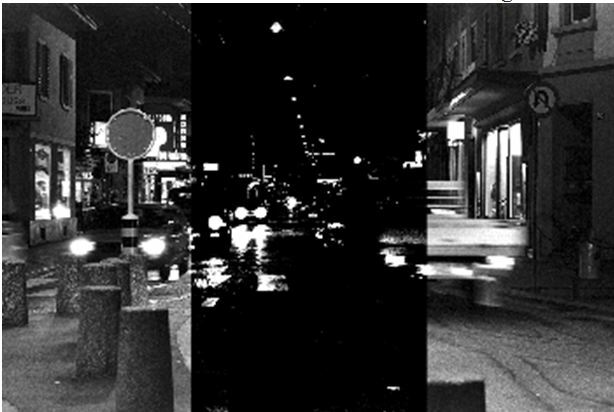 Night blindness, also called nyctalopia, is a symptom of several different diseases or conditions. All of the possible causes of night blindness are associated with the way in which the eye receives light rays. Light travels through the cornea and lens and lands on the retina at the back of the eye. The retina is composed of photoreceptors. Photoreceptors are specialized nerve cells that receive light rays and convert them into electrical signals, which are then transmitted to the brain, creating an image. There are two types of photoreceptors, rods and cones. There are three million cones and 100 million rods in each eye. The two different photoreceptors are similar in structure, however, rods have a larger outer segment than cones. The outer segments of photoreceptors contain light-sensitive photopigments which change shape whenever light rays strike them. Rods contain the photopigments retinal and rhodopsin, whereas cones contain retinal and three different opsins. Rhodopsin is only able to discriminate between different degrees of light intensity, whereas the opsins of cones distinguish between light wavelengths in the red, blue, and green ranges. Hence, rods see only black and white, but cones see colors. Also, rods enable the eyes to detect motion and provide peripheral vision. 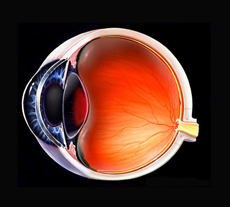 Rods are responsible for vision in dim light, and cones are responsible for vision in bright light. The rods are spread throughout the retina, but the cones are only in the center of the retina. Vision in dim light or darkness is blurry because of the connections between the photoreceptors and the nerve cells which are linked to the brain. Each rod must share this connection to the brain with several other rods so the brain does not know exactly which rod produced the signal. Alternatively, vision in bright light is sharp because each cone has its own connection to the brain so the brain can determine exactly where on the retina the signal originated. Another feature of rods is that they must adapt to darkness. This is best exemplified by walking into a dark movie theater. At first, one can see very little. With time, vision improves and one is able to discern objects. Ultimately, one can see moderately well. This dark adaptation process occurs because of the chemical nature of rhodopsin. Rhodopsin is decomposed in bright light making the rods nonfunctional. In darkness, rhodopsin is regenerated faster than it can be decomposed. Dark adaptation takes about 15–30 minutes and, when complete, increases light sensitivity by about 100,000 times. Cataracts. This condition is characterized by a cloudiness of the lens. Congenital night blindness. This is an inherited, stable disease in which persons suffer from night blindness. Recent advances in gene mapping have identified several mutations responsible for this form of night blindness. Liver conditions. Reduced night vision can be linked to poor liver functioning, due to a variety of conditions, which impairs vitamin A metabolism. Macular degeneration. Degeneration of the macula retinae, a specialized region of the retina, can cause night blindness. Retinitis pigmentosa. This is an inherited eye disease in which there is progressive deterioration of the photopigments of the photoreceptors, eventually resulting in blindness. The rods are destroyed early in the course of disease resulting in night blindness. Night blindness in children may be an early indicator of retinitis pigmentosa. Recent genetic studies have identified mutations related to retinitis pigmentosa on human chromosome 19. Vitamin A deficiency. Night blindness is commonly caused by a deficiency in vitamin A, in fact, it is one of the first indicators of vitamin A deficiency. Xerophthalmia. This condition is characterized by dryness of the conjunctiva (the membrane that covers the eyelids and exposed surface of the eye) and cornea, light sensitivity, and night blindness. It is caused by vitamin A deficiency. Xerophthalmia rarely occurs in countries with adequate supplies of milk products. Zinc deficiency. Zinc is a mineral that is necessary for vitamin A to improve vision. Night blindness can be diagnosed and treated by an ophthalmologist, a physician who specializes in eye disorders. Opticians can only dispense eye glasses but optometrists may be able to diagnose and treat vision problems. Diagnosis begins with a detailed medical history regarding the night blindness. Questions include: severity of night blindness, when night blindness began, did it occur gradually or suddenly, etc. An eye examination is performed. A slit lamp examination, in which a narrow beam of intense light is used to examine the internal components of the eye, may also be performed. Additional testing may be performed based upon the results of these standard tests. Changes in vision should never be taken lightly. Because night blindness can be a symptom of a serious disease, an ophthalmologist should be consulted before a person embarks on self treatment. Persons who experience night blindness should not drive during the evening or at night. Additional safety precautions should be taken. Alternative remedies may be effective at reducing night blindness, particularly when caused by a vitamin A deficiency. Because night blindness can be caused by a vitamin A deficiency, supplementation with vitamin A, or eating foods rich in vitamin A, may help reduce symptoms. Vitamin A was found to slow the progression of retinitis pigmentosa. Foods rich in vitamin A include dairy products, egg yolks, fish liver oil, and liver. Pregnant women should consult a physician before taking vitamin A supplements because of the link between this vitamin and birth defects. Vitamin A in humans is primarily obtained by conversion of beta-carotene, a pigment found in fruits and vegetables. Food sources for beta-carotene include apricots, asparagus, broccoli, brussel sprouts, cantaloupe, carrots, cherries, kale, lettuce, mango, mustard greens, papaya, peaches, pumpkin, red cabbage, seaweed, spinach, sweet potatoes, watermelon, winter squash, and yams. Zinc is necessary to transport vitamin A from the liver to the retina, so zinc supplementation (up to 25 mg daily) may help improve night vision. Docosahexaenoic acid (DHA) helps to increase rhodopsin levels and lines the photoreceptor cells of the retina. DHA is converted from omega-3 fatty acids, both of which are found in certain fish oils. The suggested daily dose of DHA (from fish oils) is 500–1000 mg.
One researcher found that some persons have reduced levels of photocurrent transmission (transmission of light signals from the eye to the brain) which can cause, among other things, night blindness. Colored light therapy, in which colored light stimulates the brain, can reduce night blindness caused by this photocurrent deficit. In colored light therapy, patients look at a device that cycles through 11 wave bands of color. Treatment involves 25–30 sessions over a period of four to six weeks. Night blindness caused by vitamin A deficiency will be treated with vitamin A supplements. Night vision devices are available which collect and magnify tiny amounts of light to help persons with night blindness see as well as they can during daylight. Vitamin A supplementation may slow the progress of retinitis pigmentosa. There is no cure for retinitis pigmentosa or macular degeneration, but there are treatments, including laser surgery and the drug thalidomide, which slow down the growth of blood vessels. Cataracts require surgery. Vitamin A can effectively treat night blindness in persons who have a deficiency of this nutrient. Vitamin A may prevent night blindness and slow the progression of eye conditions, such as macular degeneration, which cause night blindness. Wearing sunglasses during the day can prevent eye damage.